Overwatch, Blizzard’s first foray into the shooter genre, is the best team-based shooter since Team Fortress 2. It is also a brand new intellectual property; a rare and dangerous thing in a world of annual sequels. Overwatch was not a guaranteed success (even with Blizzard behind it). Gamers don’t need to look any further than EA Bioware and “the game that shall not be named” to know that studios with even the best pedigree can drop a stinker when venturing into a new genre. I say this all up front for the simple fact that no amount of advertising, hype videos, 9.5+ million open beta players, or past history with Blizzard games was going to convince me to care about this game. It was a shooter from an RPG/RTS company. However, then came the word of mouth via live streams (something I’ve really only recently started enjoying since Guild Wars 2 Heart of Thorns launch), podcasts, and a myriad of Youtube videos. Before long I had overwatched Overwatch to the point where I figured I was better off playing it than watching it. Then I found out the basic game was only $40, came with all the heroes, and had no plans of a League of Legends style monetization scheme. I couldn’t enter my Paypal information fast enough (yes, I use Paypal for purchases). Like most Blizzard games it takes only a few minutes to realize how much a player is going to enjoy the game. On first load the game drops the player immediately into a tutorial that is quick and efficient at getting the player oriented. After the tutorial the player is given the option to continue to a practice match against the AI or to skip to the real deal. I opted for the real deal. Before making it to the “real deal” I quietly enjoyed the snappiness of the main menu screen. I was able to quickly jump in and out of settings, the heroes gallery, loot box screen, and other menu options. This minor feature did not go unnoticed by this gamer. After my experiences with the Star Wars Battlefront open beta where the slow-loading menu screens locked up repeatedly and more recently with the work-in-progress Tastee: Lethal Tactics problematic menu it is refreshing to launch a game where the menu just works. A couple clicks and I was in a game via the quick play option. I noticed that I was dropped into a game already in-progress. Overwatch is very good about refilling empty team slots that open during the middle of a game due to disconnects or rage quitters. Players that end up filling these vacated slots receive a nice experience bonus for finishing out the game. Feeling overwhelmed by the number of hero choices I settled on Soldier 76 which is the character used during the tutorial. I felt familiar enough with 76’s abilities (sprint, rocket, and machine gun) to have confidence I would be helping and not hurting my team during my first game. Overwatch does not lock players into a single character choice for each game. While in the spawn area players are free to change their hero which results an ebb and flow of team composition throughout the life of the match. I nabbed a couple quick kills and I was hooked on the game. In a couple minutes the game finished out with our team securing a victory. I noticed a +1500 EXP “first win of the day” bonus and watched as my profile leveled up. I played several games back to back and make quick progress through the levels. I noticed while leveling up that I was earning loot boxes. I took a break in the action to navigate to the loot box screen. From my DOTA 2, Guild Wars 2, and TF 2 chest experiences I had expected the need for a key to unlock the loot boxes. To my surprise there wasn’t any key requirement in Overwatch. I was allowed to open the loot boxes free of charge. A bunch of voice lines, sprays, and icons popped out as I opened the boxes and after about four loot boxes out popped a new skin for Soldier 76. These small trinkets really don’t intrigue me, but it was a pleasant surprise to land a new skin for a hero I was playing regularly (not to mention that there was an equip now option on the loot box menu saving me from having to click around the hero gallery; another small touch of polish in the menu system that did not go unnoticed by this gamer). After a couple dozen games I am enthralled by Overwatch. Blizzard has “done it again” so to speak. It’s amazing how Blizzard was able to take on the massive undertaking of a new game genre (for the company) combined with a new intellectual property and be this monumentally successful with it on day one. The open beta hit 9.5+ million players. I can’t even fathom how many players are in at launch. All of this with none of the trappings of the “free 2 play” standbys. Pay once and play; the way games have existed for decades. Count me in. Overwatch has an astounding eSports grass roots campaign already. Blizzard is not new to eSports and it’s obvious they intended for eSport leagues to feature Overwatch as a primetime feature. Yet it is amazing how the eSport community has dived in head first all the way back into the beta periods. Overwatch is an immediately watchable game as a spectator and I look forward to where the scene goes. Secondly the game runs like a dream. Whether on my four year old desktop gaming rig (AMD CPU and Radeon graphics card) or on my several-years-aging Alienware laptop (Intel CPU and Nvidia mobile graphics card) I’ve experienced zero glitches or performance hitches which is a welcome surprise as I’ve been traveling since the game’s launch and have had to play on my. My only hiccup has been the game not saving my preference to launch in fullscreen (which I think is related to having multiple monitors). A quick note on the hero Bastion: he is not overpowered. However, I will agree that Bastion is a problem. In my view Bastion is simply not interesting. He is a strong solo character that doesn’t spur any sort of interesting teamplay dynamics. For this reason I think something has to change, not because he wrecks newbs and steals plays of the game from more deserving players, but because he doesn’t fit in the structure of the game in my opinion. Zenyatta – I have a mixed history with support characters. Towards the end of my Dark Ages of Camelot career I had gotten comfortable with the Migard Healer class becoming an invaluable player for many solid groups. In Shadowbane I primarily played support hybrids. In World of Warcraft I played shaman but grew to prefer the DPS shaman playstyle instead of healer. In Warhammer Online I took a step into the tank role as an Ironbreaker. In Team Fortress 2 I often found myself playing engineer or medic preferring to stay out of the chaos. All of this history to illustrate that I have a penchant for support roles in games so it should not be a surprise that I fell in line with Zenyatta in Overwatch. I would classify Zenyatta as a “buffer/debuffer” support class. He is able to apply a passive heal buff on a team mate or a damage-increase debuff on an enemy. The buff only lasts while the target is within line of sight which keeps Zenyatta in balance (in previous iterations the healing buff persisted even outside of line of sight which allowed the Zenyatta player to hide while still providing a strong healing presence on the front line). Additionally Zenyatta is equipped with a strong, yet slow firing and slow traveling, attack. Between the buff/debuff and strong attack it makes for a very enjoyable character to play. 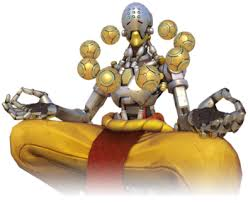 Add onto this Zenyatta’s ultimate ability which turns him invulnerable while healing everyone within the immediate area and it is easy to see how key this support hero is to your average team. I’ve had my most memorable games while playing Zenyatta and teaming up with a tank character. Junk Rat – This hero is equipped with a grenade launcher, trap, and remote-detonated mine. 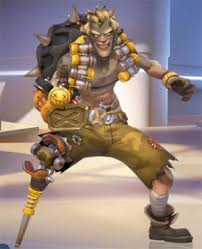 Junk Rat is geared towards defense, but can be extremely effective during aggressive pushes thanks to his ultimate ability that can clear a room in a heartbeat without putting the player in danger. After executing his wheel of death ultimate the player is warped back to the initiation point and can continue with the push. With practice a Junk Rat player can land direct hits with the grenade launcher for devastating direct damage. Add in the trap and remote-detonated mine and this is a very competitive character. Junk Rat is also one of the few heroes where I don’t feel like there is a hard counter. If an enemy shows up that can hand Junk Rat his junk a skilled player can adjust their play style to counter. This is not to say Junk Rat is overpowered, but simply well-rounded instead of specifically focused. I’ve had some amazing “play of the game” moments captured with Junk Rat. In one play I was able to thwart a team push by diving in dropping my trap and mine just in front of the push and detonating as soon as the rush tripped the trap. This activated my ultimate which I was able to quickly pop in the middle of the mayhem and a short hop later detonated for a double kill. Torbjörn – The TF2 Engineer reimagined in Overwatch. Torbjörn builds and upgrades turrets and then spends the match chasing spies and snipers… err… I mean Tracers and Widowmakers away from destroying them. Properly placed turrets, just as in TF2, are a lynch pin of defense. 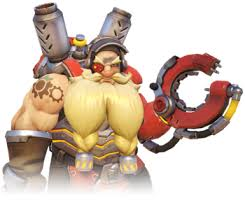 And unlike Bastion, Torbjörn brings a host of interesting team dynamics from the ability to provide armor upgrades to his dual purpose ultimate either providing a critical turret boost at a critical moment or allowing the player to unleash massive direct damage OR DO BOTH! I have to admit though, honestly, the only reason I play Torbjörn is when I am stuck on a bad team and am sick of the backline getting cut up by highly-mobile characters. A turret placed just behind the frontline can do wonders for keeping harassing offensive players out of the backline.